BIS is in progress of recording a complete cycle of the keyboard works of C.P.E. Bach, both the solo works and those for keyboard and orchestra. The cycle has been so far entrusted to Miklos Spanyi who is in the progress of locating, editing and publishing all of these works for Konemann Music of Budapest, and so we are likely to receive more issues in this series as the research continues. Three of the works on this disc are described as "World Premieres" and presumably as Miklos Spanyi's work progresses there will be quite a few other works which will see the light of day through his efforts both as historian and artist. 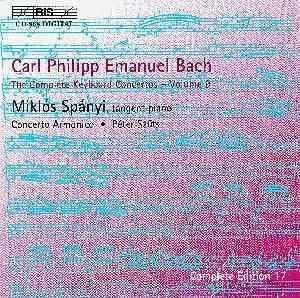 The concerto H446 (W.96) which opens this disc was the first concerto which Bach wrote after the debilitating effect of the seven years of war between the Austrians and Prussians in the late 1750s and early 1760s. Berlin, where Bach was located, was almost emptied of the kind of public that would have attended musical functions because of the fear of invasion. Shortages of money presumably also had a major effect on commissions on Bach from his patron, King Frederick. This had its impact on audiences as well. There was an increase in the plebeian element among the audiences and this called for works of a more public nature. Bach responded by starting to write Symphonies: three movement works for strings to which had been added flutes, oboes, trumpets and even timpani. These were public works and started to instil a growing interest. The concerto H446 was presumably written with this in mind. C.P.E. Bach wrote sonatinas as well as concertos for keyboard and orchestra. 'What is the difference? ', I can hear some of you saying. The concertos were more serious works, written for performance for small highly educated audiences, usually in the classical format of quick slow quick, with the first movement being the most complex. The sonatinas were lighter and less formal presumably more attractive to the new audiences. Listen and enjoy !!! We have, with the current issue, an example of the excellent work which is being done in this field, not only to uncover and publish unknown works, but also to enable us to hear the fruits of this research. I am sure that C.P.E. Bach would have been absolutely delighted with the results as presented here. Lively, highly accurate playing by a group set in a very believable acoustic, presented to us with exemplary documentation on the works, the artists, and the instrument being used. BIS are to be congratulated for an excellent issue, and if this area of music interests you, do not hesitate to obtain a copy.